Clone hard drive means creating a copy of a hard drive on another disk (which will be a “clone”). Using Handy Backup, you can clone HDD or SSD drives to an exact copy in a VHD format, accessing both local and network drive, and restore the image to a local or external disk (except a current system drive). Hard drive cloning software creates not a simple copy of all files from one disk to another. Instead, it copies a disk mirror on a logical level, sector by sector, reading and replicating an internal hard disk structure including file allocation tables, boot records and all the information stored on a drive. These are some necessary functions for any hard disk cloning tool, providing efficiency and stability. Handy Backup meets all these requirements, allowing scheduled, automated hard disk cloning, without stopping using a copied hard drive for other purposes during saving an HDD clone image. A clone HDD software solution must allow automatic schedule for running tasks on a regular basis, by either a time (or an interval) or by an event occurred in the system. Network-based editions of Handy Backup (e.g. Network and Server Network) can schedule and perform HDD clone on a remote machine in a local network under the centralized control. To create a copy of a disk in use without compromising efficiency, hard disk mirroring tools must copy the drive content in a “hot” mode, e.g. without stopping using a disk by other applications. 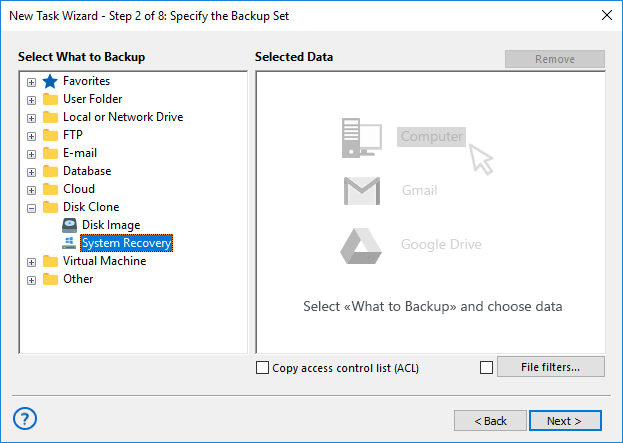 As clone hard drive software for Windows and Linux, Handy Backup has some principal advantages over manual or script-based HDD clone jobs. Logical-level output, allowing clone HDD to HDD or SSD, and SSD to HDD or SSD. 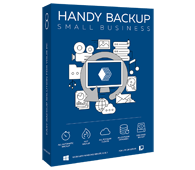 Best clone HDD software for a single machine, the Small Business edition also allows creating backups for any other server-level or user data existed! Free 30-days trial version! To clone HDD to HDD or (HDD to SSD, or any other possible media into another) with an automatic task for Handy Backup, please follow the next instruction. Run Handy Backup and create a new backup task, calling a Wizard by a button on the panel. After the Step 1, select the “Disk Clone” option on the Step 2 by clicking on a “+” on it. Select the “System Recovery” plug-in by double-clicking on it. Mark the drive(s) that you plan to mirror by a checkbox besides a drive name. 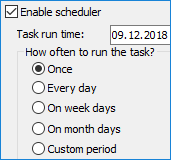 Click OK and return to the Task Creation Wizard. Make all other task parameters step by step. On the Step 5, you can clone hard drive with encryption, using an appropriate option. When finishing, run a task or wait for a scheduled running. Now create a new restoration task. On the Step 2, enter into your storage of HDD/SSD clones. Find a file called backup.hbi and select it by double-clicking. In the appearing dialog, click the “Change location” button. Select a new drive to write a hard drive clone on it. Click OK and continue creating a task. After you finish, all done! Your tasks will run as a pair, one creating a HDD clone image and the next restoring this image into a different hard drive than an original. We will strongly advise to keep a big amount of space on the intermediate file storage where your clone lives before restoration! The Handy Backup Disaster Recovery (HBDR) utility provides another way for software hard disk cloning. 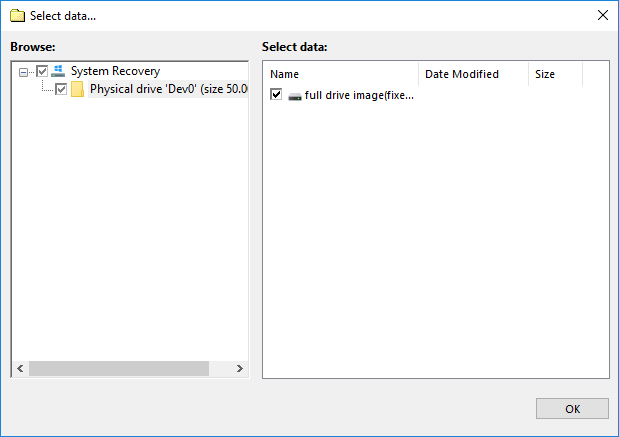 You can copy an entire drive to an external device containing a HBDR boot loader and then copy this drive clone to any other disk (including “bare metal” copying to a new or scratch PC). For details of HBDR utility, please refer to the User Manual. HBDR is freely available for customers of Handy Backup Professional, Small Server and Server Network editions. It even allows creating a bootable HDD or SSD image to boot with a HBDR loader! Hard drive cloning is easy and accurate with Handy Backup! Going to use transferring system to another HDD by Handy Backup. Please write if there are any questions.